First off, I want to thank you Marcus, for keeping the spirit of this project alive. Trespasser was a great experience for me, and it is a wonderful thing to see that all the hard work all members of the Trespasser Team invested inn , is still appreciated after so many years. I want to thank Philip Salas. Not just for a great game, but also for being such as good friend since we started to talk :). I could never dream that Philip would appriciate our work like he does. Thank you very much for this interview Philip! I want everyone who play Trespasser to not only think about the game, but also at the team who worked on the game. They worked hard, and even if the game didn’t turn out as they wanted to be, and that most people in the world thinks it’s a awefull game, remember that they did something no one have done today. Trespasser is more realistic that most games today. Trespasser is a game we should be proud of, YOU are a part of it’s history. How did you end up working on Trespasser at Dreamworks Interactive? I used to work with Sean Connor and Wei Ho in a Game company called Adrenalin Entertainment, before signing on to the Trespasser teem at DreamWorks. After Sean and Wei left Adrenalin to form part of a new startup company, which was at the time top secret as too who it was (DreamWorks Interactive), they let me know they were working at this great new place, and the team that was forming, was looking for additional AAA talent to from part of an awesome new project under way. I set up an interview, and was hired on as a Sr. Artist to the Trespasser teem shortly after. What exactly was your job description on the Trespasser team, and what parts of the game did you ultimately work with? As mentioned before, I was first hired on as Sr. Artist. My first assignment was to work on secondary assets, as all newbie’s on the teem were, in order to break into the mechanics of the game. Once acquainted with the technical aspect of the game, Terry and Seamus confided in my results, and I was assigned tasks, as one of the Sr. Environmentalist artist’s in charge of producing the various areas within the game ( Beachhead -game start, Industrial jungle, Pine Valley – first half, Lonnie worked on the second half by the cliff sides, All sky’s within the Game, and final touches and clean up to most areas within the game). I also made various assets ranging from miscellaneous objects ( signs, road signs, mechanical objects, statues, etc), Buildings (Hammonds House, Lab, Courtyards, etc), the Interface and loading screens, and various promotional art assets (box art, Game Magazine PR art samples and cover) During this process, Seamus and Terry in trusted me with the honor of becoming the new Art Director, upon Terry’s departure form DreamWorks. How did the various team members get along? Like on all projects, some got along and some didn’t, but this is usually the case. Some get along better than others, and like on most projects of this magnitude, a sense of “Family” develops between teem members, This means that in close quarters, tempers tend to fly. Overall I can say that I’ve seen and heard of worst scenarios through out my carrier , and I have to say that the Trespasser teem got along quite well. You have to understand, that within the structure of the company at the time, as a teem, we had a big responsibility within our hands, and were pretty much isolated from this rest of the teems that were working on other projects within DreamWorks. Trespasser was to be something revolutionary, and as a teem, we had to live up to the very high standards that was in trusted to us. Seamus guided us to do our best, and allot of us proudly invested in that wonderful dream called Trespasser. All in all, I think that what we tried to achieve, ended up as a great task, achieved by a very talented crew. What happened with the team between the time Trespasser was finished and when it was finally disbanded? Some teem members left, some were let go, and the remaining few went on to work on other projects within the company. Among other tasks I was assigned, Kyle and I went on to make a demo for a new project “ Strange Eons” which later became “Undying”. Our task was to get it green litt, and we did. I have to add in here , since we are talking about teem members, I have to add that Kyle McKisic is one of the nicest guys in this industry, and I’m proud to say, that he is one of dudes I learned allot form him at the time. Since the trespasser days, some of us still are in touch (Brian, Rolf, Seamus) and are good friends. What projects have you been involved with after that, including now? So many dreams lost and fulfilled, jaja, game wise though, I went to “Call to power II” by Activision, and Kinetica when I was at Sony. Since, still going through the growing pains of trying to contribute to the industry I love, with my own humble“Start up” entertainment company. This industry has its ups and downs, but I can’t think of doing anything else, I think it must be amongst the most rewarding of all. (ups and downs included). Do you believe being involved with Trespasser helped or hindered your career? It most definitely “helped me”. I learned so much being a part of that teem, and its still a great honor for me to have been a part of it. Are you surprised that there’s still an active community for the game? “Yes” and “No”. Yes because so much time has gone past, and for the most part, the game was not well received by the industry we made it for. No because it was one of those projects that was ahead of its time, besides all the hard work that as a teem we had put into it. What was the inspiration for the art style in Trespasser? For me personally, because I can only speak for myself, the mystery behind a mystical forgotten world beyond time. Do you feel the engine did justice to the artwork (rendering wise)? At the time “yes”, there was so much put into the game, we did our best, based on the decisions that had to be made of the time. Of coarse that in hind site, there was so much more that could have been done to make the game better in way or the other, technically speaking , decisions had to be made, and we had to go with the decision which shipped the game. Was there ever a Trespasser Press Kit released? We’ve noticed some info and pictures repeated through various websites.. Yes there was, the man in charge of that wonderful task was Mr. Rich Flier. Did you ever play Trespasser after its release to see the results of your work? If so, what did you think of it? Have not played Trespasser in years. 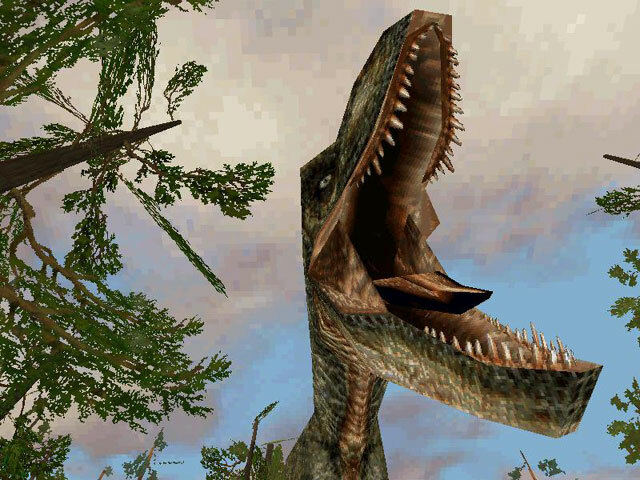 Do you think Trespasser would have fared better if it had been done more recently, with the advances in PC hardware that only became available after that time? If you had the chance to start Trespasser over again (say, you get sucked back in time), what would you do differently? …Would have gone the hardware route, but there was allot of specific issues as to the reason we had to go the software route …. Art wise, ”nothing” we did everything possible and available to us at the time to make the game look beautiful. What was the best and worst thing you remember about the time working on the project?